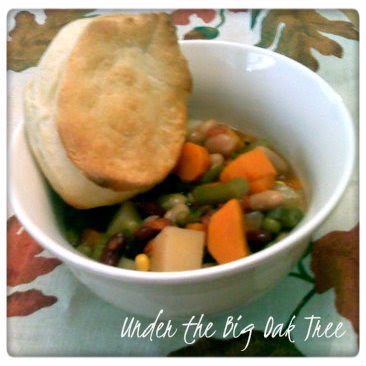 I came across this recipe for Hearty Vegetable Soup while looking for easy and healthy dinner options last week. Since I had most of the ingredients on hand, I decided to prepare the soup last week even though I already had the meals for the week planned out. What can I say? I'm easily swayed by easy soup recipes! Especially, crock pot recipes! As usual, I made a few changes. I wasn't sure how I'd like allspice in the soup, so I left that out. An easy decision, since I didn't have any in the spice rack! Combine all ingredients in crock pot and cook on low for 8 hours or until carrots and potatoes are tender. The original recipe stated the cooking time to be 8 hours on low. My crock pot usually cooks faster, but this time it took the full 8 hours. Probably because I added my vegetables while they were still frozen. Using thawed vegetables or cooking on a higher temperature would probably speed up the cooking time a bit. This made 6 hearty bowls of soup. You could probably stretch the recipe further, making it a thinner soup by adding more broth. Small pasta and/or shredded chicken or even ground beef would be a good addition as well. How easy is that?! I love when it doesn't matter what order you add the ingredients to the crock pot! I really enjoyed this soup. It reminded me of a minestrone soup but without the pasta. I'm sure this recipe will be appearing in more than a few of our menu plans during the fall and winter months!